Dungeons & Dragons is, intrinsically, a very physical experience: You’re surrounded by pens, stacks of paper, and rulebooks, rolling dice, talking to your friends. But Wizards of the Coast is planning to help modernize the way fans play the game with the introduction of Beyond, a new app that wants to help balance the physical experience of role-playing D&D with a decluttered, all-digital support system. Being developed with Curse, Beyond marks a huge step for Dungeons & Dragons’ approach to digital supplements—especially because of the fact that the company had resisted creating official digital tools for the game, allowing third party developers to make they own. Now, however, Wizards of the Coast is all-in. The base version of the Beyond app will be free and available for both PC and mobile. It includes the ability to browse basic rules for D&D’s Fifth Edition, and access to both the Systems Reference Document, for Dungeon Masters looking to create their own campaign material, and the Elemental Evil Player’s Companion, a sourcebook for creating new characters. But if fans want to get the most out of Beyond when it launches, they’re going to have to open their enchanted sack of gold. Individual resources from base elements like the Players Handbook, Dungeon Master’s Guide, and Monster Manual to supplements like Volo’s Guide to Monsters will cost $30 each to unlock access to in the app’s ecosystem, while new adventure modules will set you back $25 each. Meanwhile, two tiered subscription services will also be available as well: the “Hero” tier allows single players unlimited character creation, and access homebrew content published by fans through the app, while the “Master” tier, intended for DMs and player groups, lets users share purchased content from one app with multiple users for campaigns. We sat down with Curse’s product lead Adam Bradford to discuss just what fans will be able to do with Beyond at launch, and how the company is going to balance the appeal of digital convenience with D&D’s legacy as a distinctly non-digital experience. io9: Tell us a little bit about what D&D Beyond does for a D&D player. Adam Bradford: D&D Beyond is an official digital toolset for Dungeons & Dragons for the fifth edition rules. Our focus is to make game management easier for players both at the table and between game sessions. At launch, a game rules compendium with all D&D sourcebooks in digital format will be available, as well as a character builder, digital character sheet, homebrew content creation, and the early stages of campaign management. Wizards of the Coast has dabbled with digital companions for D&D in the past, but nothing as comprehensive as D&D Beyond. Why now? Bradford: Creating a comprehensive toolset for D&D is challenging. It’s “structured make-believe”—there are rules, but no real limits. As much as I enjoy playing an open-world video game, those games are still bound to the edge of the map. I think that because of that challenge of digitizing D&D, it’s taken some time to get here, but we’re committed to make it worth the wait. Dungeons & Dragons is in the zeitgeist today, more popular than it’s ever been, and Beyond is coming alongside to welcome all the new players and enhance the game experience for veterans. While third-party apps have come along to fill in gaps over time, D&D Beyond aims to provide those long-desired tools in a single, unified place. How does the arrival of Beyond affect Wizards of the Coast’s relationship with third-party D&D apps like Roll20? Bradford: We have no current plans to create a virtual tabletop. Our intention is to work alongside the VTT partners Fantasy Grounds and Roll20 to integrate to add value for players. If you create a character on D&D Beyond, you will eventually be able to export that character to use while playing virtually through Fantasy Grounds or Roll20, and other integrations that make sense in the future. The tabletop gaming experience is an intrinsically offline one, and if you’re playing at a convention or somewhere without reliable internet, the idea of a digital app might feel risky to some players. Will users still be able to use all of D&D Beyond’s features without being connected to the internet? Bradford: A D&D Beyond native mobile app for iOS and Android is in parallel development that is central to our offline strategy. When that launches, players will be able to view any content and create and manage characters without an internet connection. Examples of the kinds of User-Created Content fans will be able to access in D&D Beyond. What would you say to old-school tabletop gamers who are perhaps wary of the game becoming a digital-physical hybrid experience? Bradford: Our goal is to use technology to supplement and enhance the D&D experience—not to turn that experience into a videogame. We want to minimize the negative impact of rules at the table, such as taking a long time thumbing through books to find an obscure rule or not remembering all your character’s options. If we do that, the other key elements of the game, such as bringing characters to life and sharing an interactive story with friends, can shine through. Players can engage with the toolset at level at which they’re comfortable. If all you want to do is automate character creation and progression and print your character sheet for a session, you can do that. If you want to continue to use physical books at the table but want something to help you prep adventures between sessions, we’re still providing value for you. Finally, where will D&D Beyond go after its initial launch? What features should fans expect that won’t be in included on day one? Bradford: We have an extensive roadmap that could extend for years. Dungeons & Dragons is growing at an incredible rate, and we will grow with it. Our focus immediately after launch will be to release the mobile app and some quality of life enhancements like dice rolling. 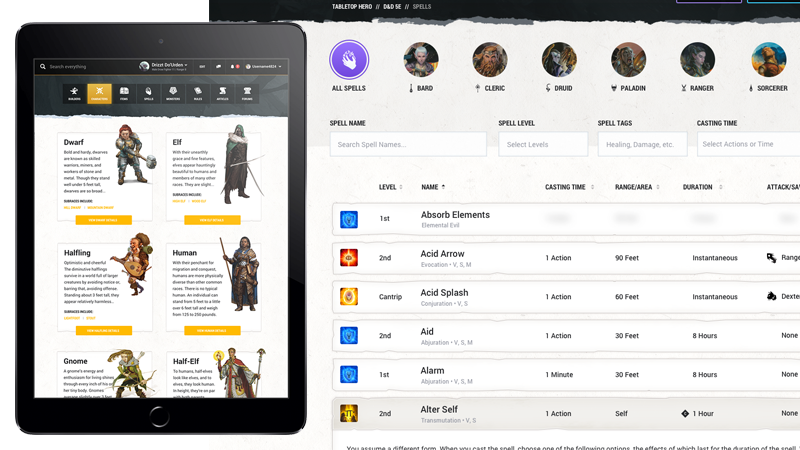 We will also introduce Twitch stream integration, where someone viewing a D&D stream will be able to hover over a character’s name to expand that character’s statistics on demand. If a character gets poisoned, that will appear on their character frame and the viewer can hover to see what the poisoned condition does. It will give viewers a way to engage with their favorite streamed games in a way they haven’t be able to before. Before the end of the year, we will work on monster and encounter building. A common practice for DMs that need a particular monster to fit into a particular challenge range more easily is to “reskin” existing monsters. We our monster builder, you will be able to scale the creature’s Challenge Rating up or down based on what you need, with all the math happening automatically. If you want to give the monster a powerful magic item, you will be able to do so and see the impact that would have on the encounter. Once we have all the character-focused tools and then monster-focused tools in place, we will bring it all together to provide initiative/ combat tracking. At that point, a DM could target particular characters with a fireball, prompting those players to make Dexterity saving throws. After rolling dice (physical or integrated), the DM would see the results immediately and be able to get right into narrating the outcome. D&D: Beyond will initially launch August 15, with a special “Founders Pack” offer selling the Beyond editions of Fifth Edition Players Handbook, Dungeon Master’s Guide, and Monster Manual for $20 each.